Retorica is the name of the brilliant young violin duo, Harriet Mackenzie and Philippa Mo, and their new CD on NMC contains an interesting and varied selection of British music for two violins, a hitherto unmined, and very rich seam of compositions. Composers include Jim Aitchison, William Croft, David Matthews, EJ Moeran and Alan Rawsthorne, as well as John McCabe His Spielend was specially written for this duo, as was David Matthews' Eight Duos, and the whole CD provides a fascinating range of compositional styles. Spielend is the German word for 'playing', and the work is based on the idea not only of the musicians sporting with each other, but also the composer playing with his musical material. 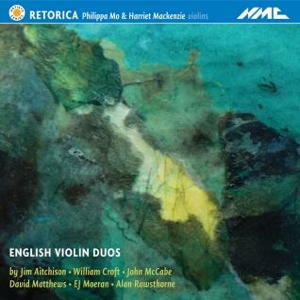 "Bach and other composers show how much can be done with a solo violin, so it is no surprise that the violin duo, seemingly a convenience of the instrumental lesson, can yield the riches vividly displayed by Retorica. EJ Moeran's Sonata is a substantial essay, pastorally flavoured, with a dazzling central presto. John McCabe's Spielend, like David Matthews's Eight Duos, Op 79, were specially commissioned and come over strongly. There's a rare, buoyant 18th-century Sonata by William Croft, but best of all is the Theme and Variations (1937), by Alan Rawsthorne, a hidden-away but patent little masterpiece."